CRDC is proud to announce that one of its customers was recently recognized by the New Hampshire Small Business Administration (SBA) Office. In celebration of Small Business Week, May 1 through May 7, the SBA along with the NH Bankers Association hosted is annual Small Business Awards Ceremony at the Manchester Country Club. Tim's Truck Capital and Auto Sales Inc., one of the largest dealership for used trucks in New Hampshire was recognized in the Family Owned Business Category. Timothy Emery, President of Tim's Truck Capital accepted the award. 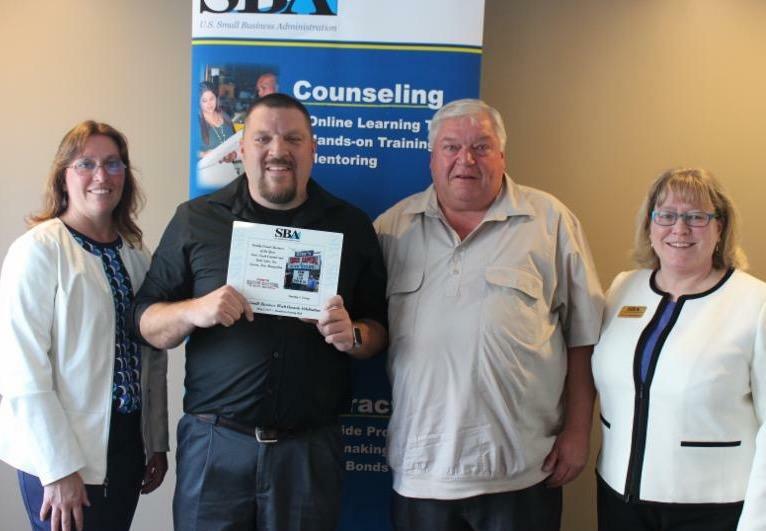 CRDC nominated Tim for the award and was instrumental with SBA 504 financing for the second-generation owner both to purchase the business from his father, Tim Emery, and to support the subsequent expansion of the business. "After Tim took over the business, he enthusiastically started planning for the future and the expansion of the service department," said Jennifer Boulanger, CRDC Loan Officer. "Tim constructed a 14-bay state of the art service facility, opened in 2016, which provides quality repair/maintenance services to their retail customers and allows Tim to more efficiently move inventory." "Our customers are loyal. We receive a lot of repeat business because we truly take care of our customers from point of sale through the life of the vehicle, and that includes maintenance and repair. We are able to service the general public better. This award recognizes the entire company's hard work in getting us there." Auto Sales with his Father and previous owner, Tim Emery Sr.